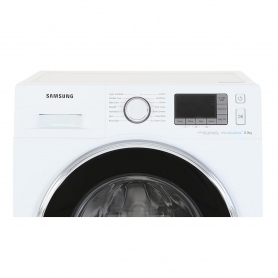 This brilliant Samsung WF80F5EBW4WEU washing machine is A+++ energy rated, which is the highest grade available. This exceptional efficiency rating means you can look after your wallet as well as your clothes. 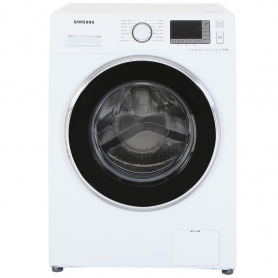 The WF80F5EBW4WEU has a white casing colour and the door rim has a sleek gloss black finish. There is also a similar model available in graphite silver with a chrome effect door rim. Take a look. 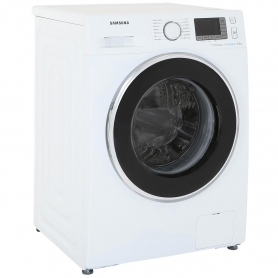 This Samsung washing machine uses the innovative ecobubble technology to wash your clothes more efficiently and at cooler temperatures. The technology mixes detergent, water and air before it enters the drum to create a cleaning foam - this penetrates the fabric faster than concentrated detergent. The A wash performance rating ensures your clothes will be cleaned to a high standard. The B spin dry rating, coupled with the high 1400rpm spin speed helps keep drying time to a minimum. 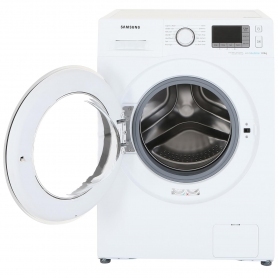 The roomy 8kg drum is spacious enough to accommodate a family sized wash load. 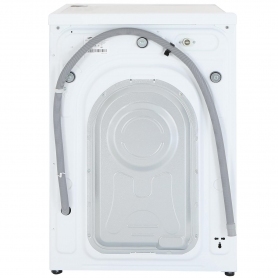 This appliance has been designed to be compact without compromising on internal capacity. With its 55cm depth, you can place it wherever you like in your kitchen or utility room to suit your space. 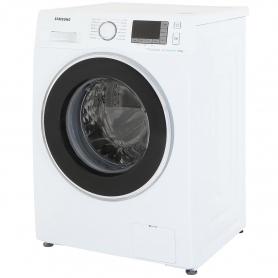 This freestanding washing machine has 16 unique programmes to choose from to suit your every washing need. Effortlessly remove stains and freshen up your clothes with this versatile appliance. The Quick Wash cycle is perfect if you’re in a hurry to get your clothes clean and ready to wear again. The Baby Care cycle has been designed to be gentle with your little ones’ clothes, while still removing tough dirt and grime. Got an item of clothing that requires special care? The Wool/Silk programme is ideal for fragile garments that require a softer cycle. The Diamond Drum helps to preserve the quality of your fabrics wash after wash. Due to the unique design, your clothes are less likely to snag during the wash cycle. Why not click Add to Basket and purchase the innovative appliance today?